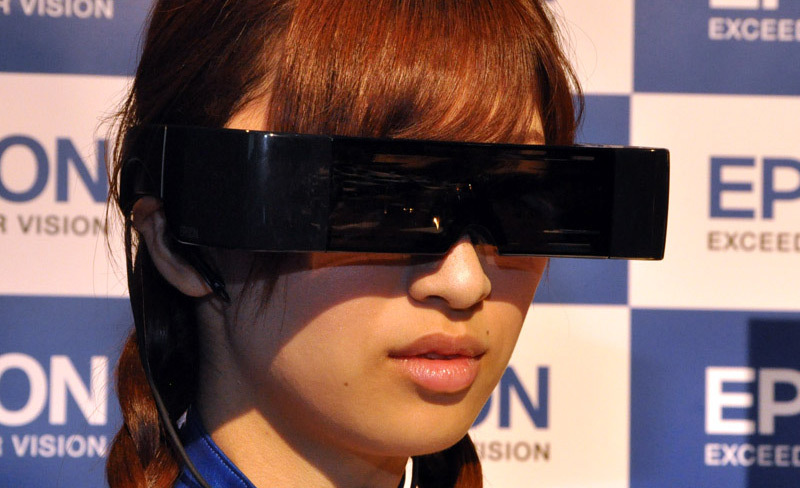 Epson Japan announced [JP] the so-called Moverio today, a see-through 3D head-mounted display (HMD), which is the first of its kind, according to the company. Think of it as mix between of NEC’s transparent HMD Tele Scouter and Sony’s cool 3D OLED head mounted display HMZ-T1, powered by Android OS. The Moverio creates the experience of watching 3D (or 2D) pictures on a virtual 80-inch display that’s 5m away – while still being able to see what’s happening around you in the real world. Apart from the display itself, users get a small controller that offers 1GB of internal memory and a microSD card slot. The Moverio supports MPEG-4/MPEG-4 AVC/H.264 video files, including – side-by-side 3D images on its 0.52-inch displays with 960×540 resolution (it handles AAC and MP3 audio files, too). Epson also squeezed Android 2.2, Wi-Fi IEEE 802.11b/g/n (direct access to YouTube and a web browser), and a microUSB into the device. The Moverio’s headset is sized at 205×178×47mm and weighs 240g, while the controller measures 67×107×19mm and weighs 160g. Epson expects to initially sell 10,000 units when the device hits Japanese stores on November 25 (price: US$770).